On the basis of a recently published report by Transparency Market Research, titled, 'Raisins Market: Global Industry Analysis and Opportunity Assessment 2018-2026', the overall revenue generated from the raisins market is anticipated to be valued at somewhere around US$ 2,177.1 Mn in 2018, which is expected to rise at a CAGR of 5.4% throughout the forecast period (2018-2026). Over the last few decades, the raisins market has gone through remarkable changes, owing to the wide application areas of raisins in various food and bakery products. The boom in the bakery industry, and rapidly increasing hotels and restaurants all over the globe, are also fueling the demand for raisins. Increasing health consciousness among the population is also contributing to the growth of the raisins market, due to their multiple health benefits. In the global raisins market, Europe holds a prominent share, i.e. 35% value share of the consumption of raisins. On the other hand, Europe has the least share in the production of raisins in the world. On the basis of our research, the raisins market is expected to grow at a high growth rate in the Asia Pacific region, owing to factors such as rapid industrialization and increasing global presence of the players involved in the food industry, which has made the raisins market more competitive. The increasing demand for dried fruits as a healthy snacking option among health-conscious population is also increasing the demand for raisins in the global dried fruits market. Many food manufacturers and food service providers are very keen on using raisins in their food products and recipes. With the increasing demand for raisins from various food industry sectors, it can be expected that, the demand for raisins will increase over the forecast period. Busy life schedules and the increasing number of working women have broadly increased the demand for convenient food products in the global food and beverage market. Customers seek convenient food products that are easy to consume and also fulfil their nutritional needs. In order to cater to the demand for convenient food products with high nutritional value, manufacturers are incorporating raisins to their ready-to-eat products as a healthy ingredient. Raisins are added in variable quantities depending on the end food product. With the increasing awareness about health among the population, the functional food market is booming due to the rising demand from all age segment customers. People seek food products that not only fulfill their nutritional needs but also have importance in the prevention of certain diseases because they possess some curing properties. Food items that are fulfilling the demand contain phytochemicals. Among phytochemicals, phenolic compounds are considered as very important antioxidants. Raisins are a rich source of catechins, resveratrol, isoflavones (daidzein and genestein), beta-carotenes, Crypto-xanthin-ß, and Lutein-zeaxanthina, which are considered as potent antioxidants. Raisins are also found to be helpful for cancer patients. According to data published in 2013, Corinthian raisins and sultanas are effective in controlling cell proliferation as far as cancerous cells are concerned. TMR has profiled some of the prominent companies active in the raisins market, such as Bergin Fruit and Nut Company Inc., Sun-Maid Growers of California, Sunbeam Foods Pty Ltd., Geobres Nemean Currants and Sultana Raisins S.A., Decas Cranberry Products, Inc., Kiantama Oy , Sunsweet Growers Inc., Citadelle Maple Syrup Producers’ Cooperative, Traina Foods, Inc., Dole Food Company, Inc., Lion Raisins Inc., JAB Dried Fruit Products (Pty) Ltd, N. Sunshine Raisin Corporation, Montagu Dried Fruit And Nuts (Pty) Ltd, Vkc Nuts Private Limited, Viva Bella Orchards Inc. and others. 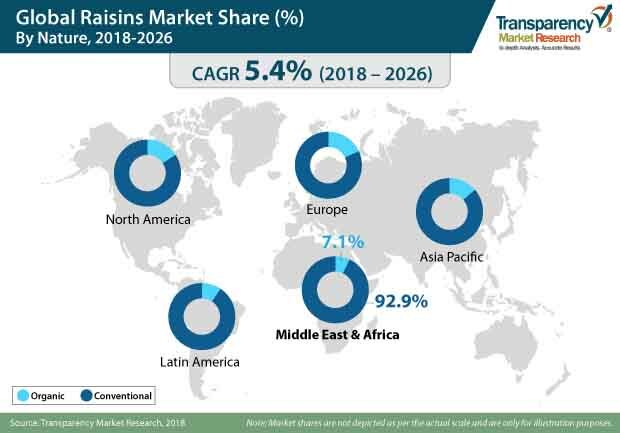 This report comprises detailed insights of the current market drivers, trends, and opportunities that are driving the raisins market over the forecast period. The report also consists of the competitive landscape of many key players involved in the raisins market in a comprehensive and comparative dashboard. In addition, the latter part of the report also consists of recent developments, key strategies, and key offerings in the market.